Horlicks Ahaar Abhiyan is an initiative that aims to increase awareness among mothers, families and communities about the issue of malnutrition among children in the age group of 3 – 6 years. The initiative will be implemented in a phased manner beginning with a pilot project, in partnership with CARE India, in the state of West Bengal and with Save The Children, in the state of Tamil Nadu. As part of this project, Horlicks aims to partner with its consumers to raise funds for spreading awareness about better nutrition for children, training health workers and creating integrated child development programmes. With the sale of every bottle of Horlicks of more than Rs. 100, the company will contribute Re 1 towards the initiative. In terms of offline marketing, Horlicks has been running the Ahaar Abhiyan TVC. This the second phase of the campaign. The first phase was executed in the state of West Bengal. Vidya Balan is the brand ambassador for this campaign. The campaign is an extension of the mainline Ahaar Abhiyan campaign. 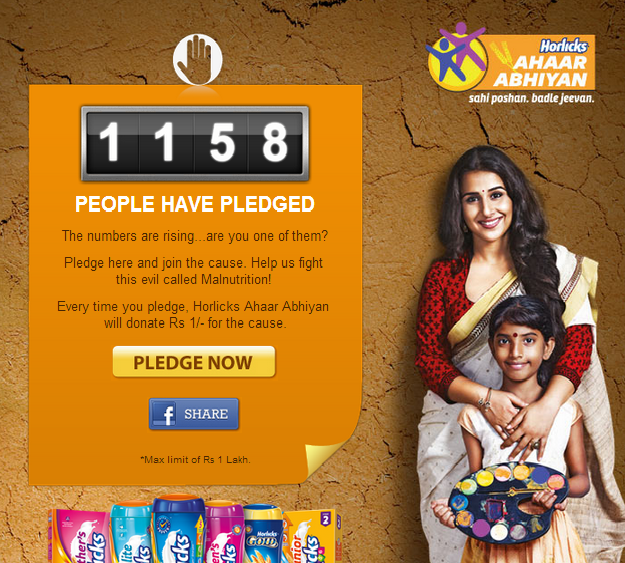 The Horlicks Ahaar Abhiyan is an initiative by GlaxoSmithKline Consumer Healthcare, the makers of Horlicks. According to the TVC, 50% of kids in India suffer from malnutrition. Horlicks is partnering with NGOs to fight against malnutrition. For every sale of Horlicks, GlaxoSmithKline will donate Re. 1 towards the cause. The Horlicks Ahaar Abhiyan Facebook page has three apps. One for making a pledge, one for making a donation and one called, ‘Art for Nutrition’. On the Pledge page, one simply has to click the ‘Pledge Now’ tab and share the Pledge on Facebook. The Facebook app then asks you to share a post to your page. On the Donation page, you can choose to donate an amount. Once you type in required details, you will be redirected to a page (depending on the NGO you choose) that gives you detail about the specific aspect of nutrition for which your donation amount will be utilized. 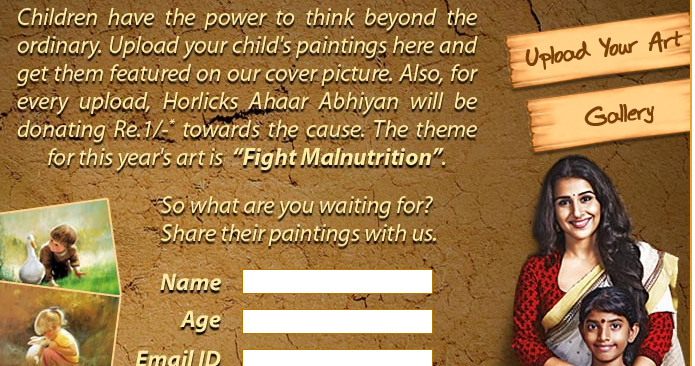 On the Art for Nutrition tab, users are required to upload their child’s paintings which should be around the theme of “Fighting Malnutrition”. Every pledge shared and painting uploaded will result in Re. 1 being donated for the cause subject to a limit of Rs. 1 lakh. It is nice to see a brand extending it’s activities from mainline channels to digital, thus, ensuring that the campaign achieves maximum reach and visibility. It is helping to create awareness, spread the word and raise online donations. You can share pledges and donations on your wall, so that the message goes viral. The idea of making your child paint is a great idea to make children aware that there are other children for whom malnutrition is a reality. In terms of engagement, the campaign does not stand out. Uploading art, donations and making pledges have all been done before. There is no integration with offline initiatives. Perhaps, including the TVC on the Facebook page would have done the trick.